I love fresh, local food, so now that we’ve launched Dough Uprising, spending every Sunday at the farmer’s market is basically a dream come true. Not that we weren’t there a lot anyway, but at this point we’re basically letting the market dictate our menu – both for our pies and for our dinner. 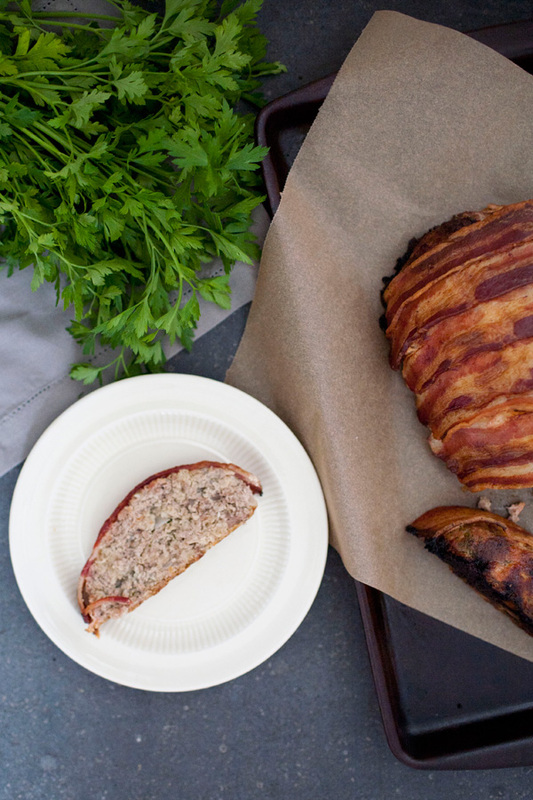 When we came home with some gorgeous, purple spring onions, we made homemade pizza… and when we came home with 2lbs of local pork, well… naturally we had to make a meatloaf. Meatloaf is one of those things I didn’t grow up eating, but that I’ve become obsessed with as an adult. It might not have a fancy reputation, but when you think about it, the dish is a tough one to get right. Cook it a little too long and it’s dry, spice it too little and it’s bland. How much bad meatloaf have you had in your life? I mean it’s practically a fruitcake. 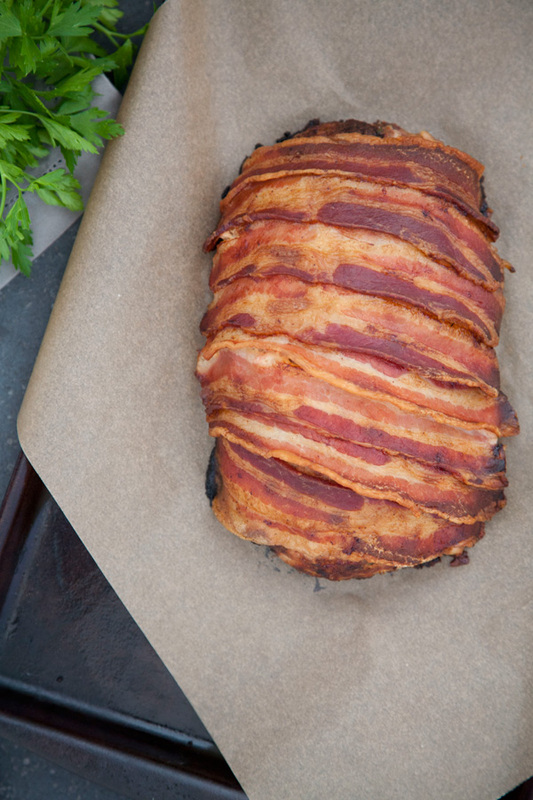 This meatloaf is not a fruitcake. 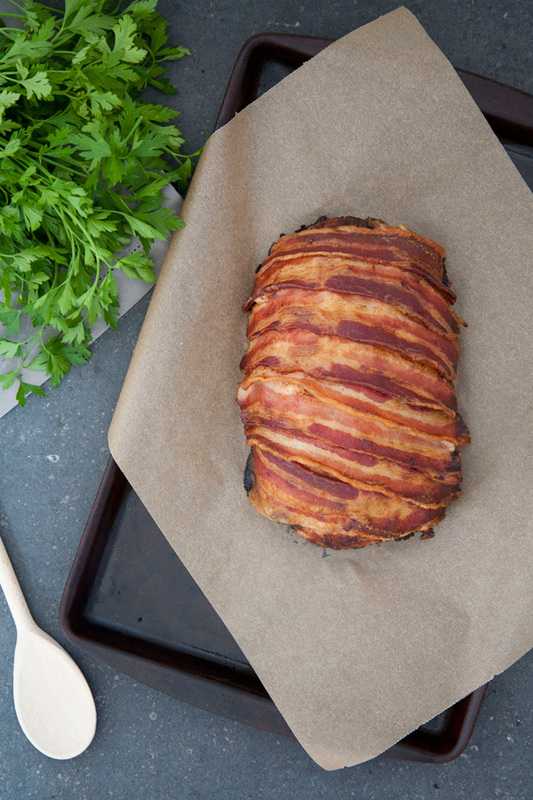 Spiced just right with a big dose of Dijon and Worcestershire and topped with a big slab of bacon, this meatloaf is everything. Moist, flavorful, easy to make. And if you eat it with a salad it’s practically health food. … at least that’s what I’m telling myself. Add oil to a saute pan over medium heat. Add onion, garlic and thyme and cook until softened, about 3 minutes; set aside. In a large bowl, add eggs, buttermilk, mustard, Worcestershire, salt, and pepper and combine. Add the onion mixture, ground pork, sausage, cracker crumbs, and parsley. Mix until thoroughly combined. Dampen your hands and move the mixture to a prepared baking sheet. 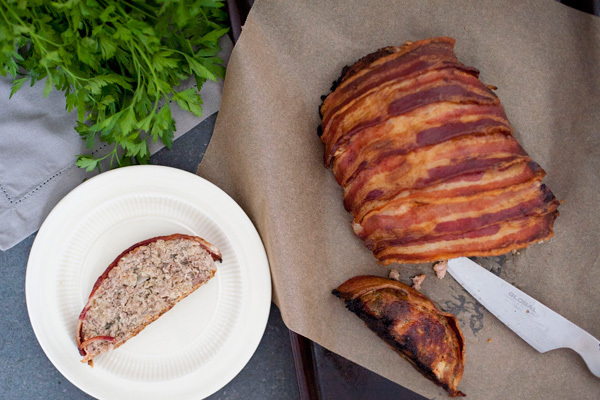 Form into a medium-sized loaf and arrange bacon across the top, overlapping each piece by a small amount. Bake until internal temperature reads 155 degrees F on an instant-read thermometer, about 55 to 65 minutes. Remove from the oven and let cool for 10 to 15 minutes before slicing. oh my goodness. this looks perfectly delicious! Um. YUM. Funny, I just got done reading a blog post about healthy alternatives… this was a nice palate cleanser. 😉 Bring on the BACON. I have eaten quite a few bad renditions of meatloaf, all made by me. One even has the everlasting nickname of ‘Meat Sheet’. Ugh, it was so bad. I’m willing to try just about anything to get it right! Haha aww Amanda, you have to try this one! I hope it will work out better for you!